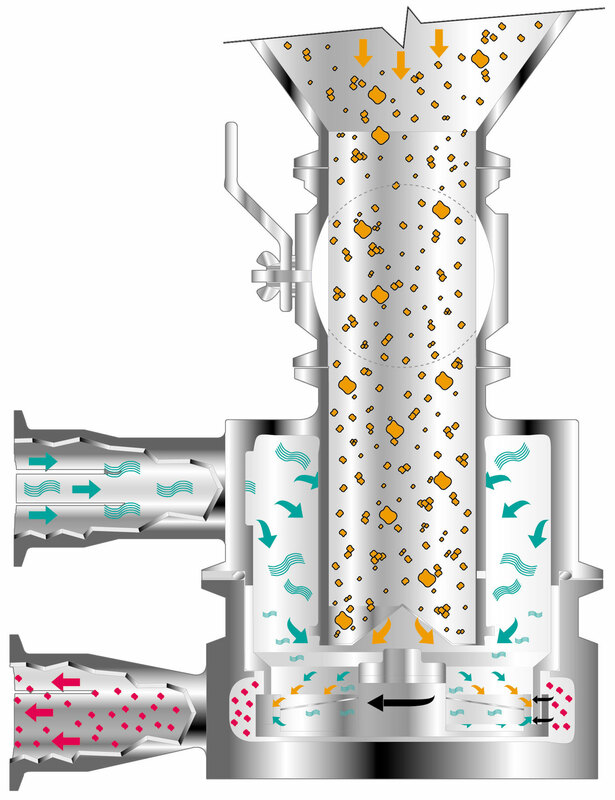 The powder is sucked in by the strong negative pressure created by the ZC-reactor head. Immediately after contact with the liquid phase the powders are instantly wetted and thoroughly dispersed. This process is actually completed before the powder is fully hydrated. Due to the extremely short time shear forces are applied, the process is a very gentle one. 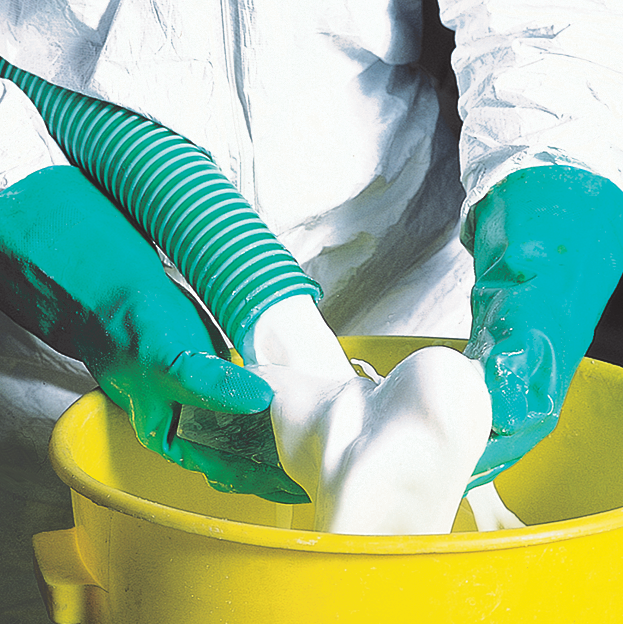 In most cases a single pass operation ensures that even when processing extremely shear-sensitive thickeners and gelling agents, the highest viscosities are achieved. The power introduced via the YTRON-ZC is used only to a limited degree to creating a pumping pressure. The main part of it is used to effectively disperse or wet out, the dry matter in the liquid phase. In combination with the appropriate pump selected for the relevant liquid phase, an extremely high pumping efficiency is achieved. For low viscosity products centrifugal pumps are used, for intermediate and high viscosity products positive displacement pumps are recommended. In the high viscosity range, 80 % or more of the energy can be saved in comparison to conventional processes. This means: No heating of the product due to mechanical energy input above the minimum during dispersion. Reproducable results are normally achieved in a single pass. The product is subject to a homogeneous, uniform dispersing or shearing effect as it passes through the reactor head. There is no portion of the flow required to bypass the shear head for pumping the liquid in a loop. 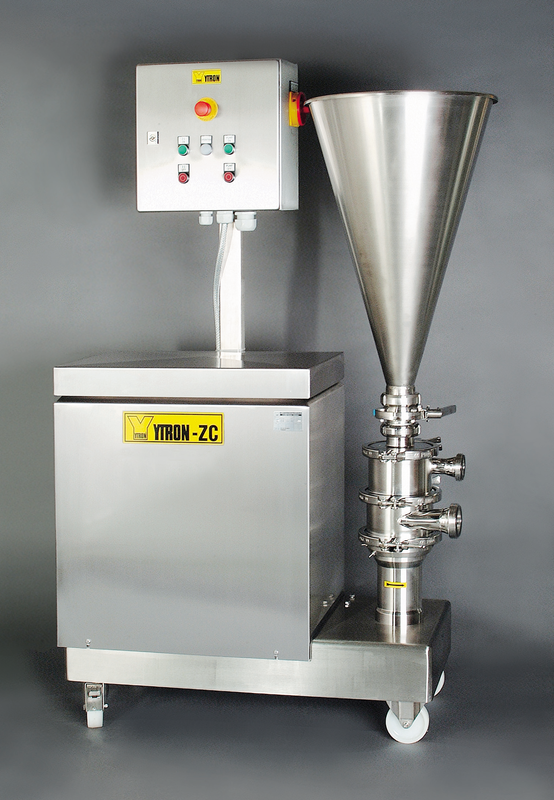 Extremely difficult to wet out powders are processed in a single pass. 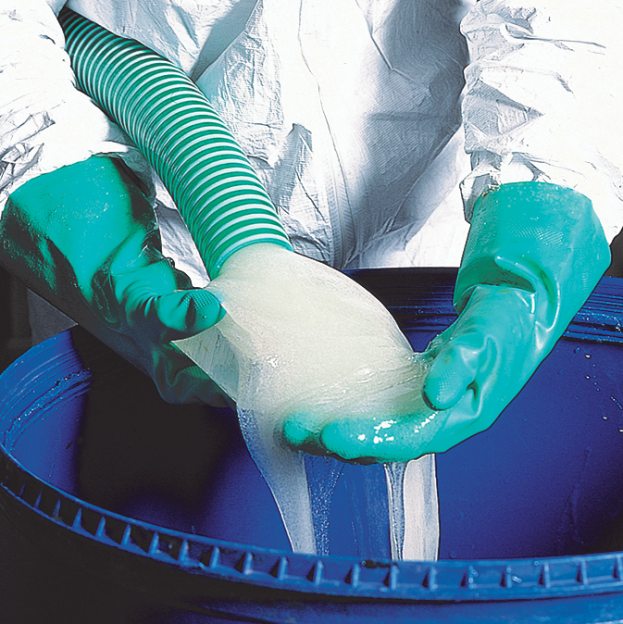 The defined application of shear forces results in a STRETCHING ® effect of the molecular chain which therefore leads to an increase in viscosity. A selection of rotor/stator slot widths are available depending on the application. No air entrainment other than the air included in the powder phase. Batch time reduced to the minimum. Feeding directly from BigBag or silo is also possible. Perfectly wetted-out products are achieved in the shortest time.